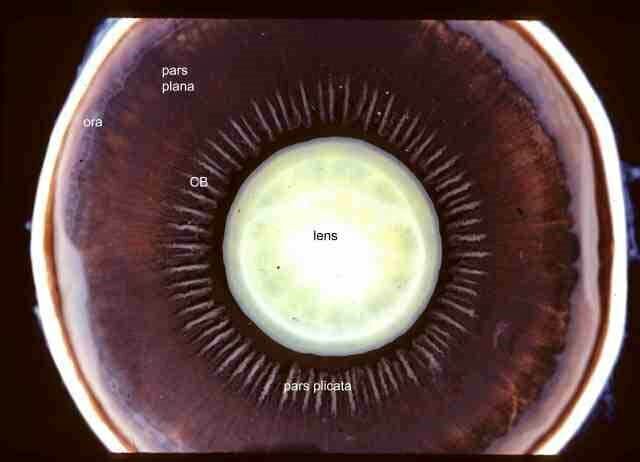 The human eyelids protect, nourish and sustain the cornea. 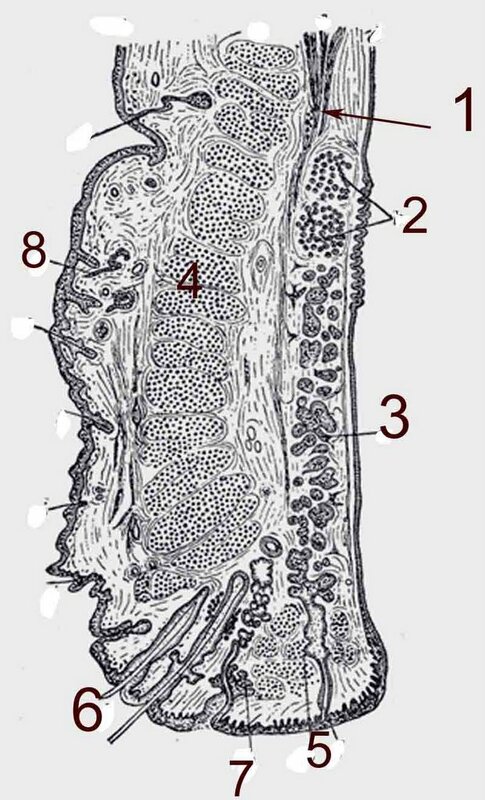 The basic structure is divided arbitrarily by surgeons into 2 lamellae, anterior and posterior. It is more realistic to consider the individual structures that comprise the lids and their function. In the photograph to the left, a low magnification, to show the cornea (1) and the lens (2) for orientation. Click on the photo to enlarge it and see the structures more clearly. 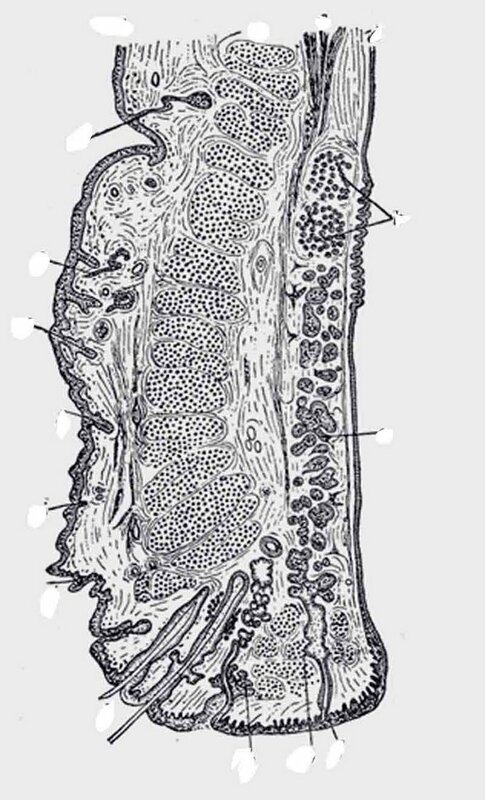 The inner lining of the eyelids is conjunctival epithelium, which contains a variable number of goblet cells. The goblet cells are high in density in the fornix (3) and less so near the marginal conjunctiva (4). 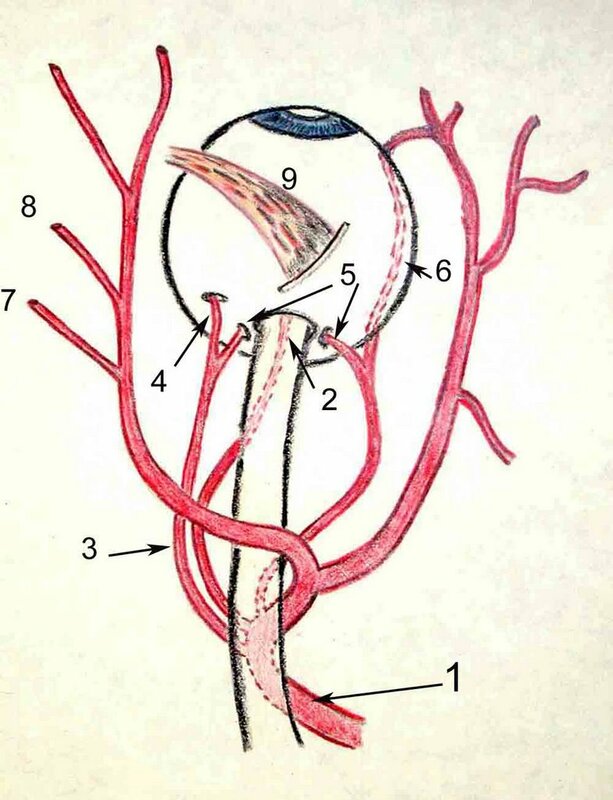 The upper eyelids also contain accessory lacrimal glands (5) known as the glands of Krauss that are scattered over the entire measure of the lids and supply constant lubrication. 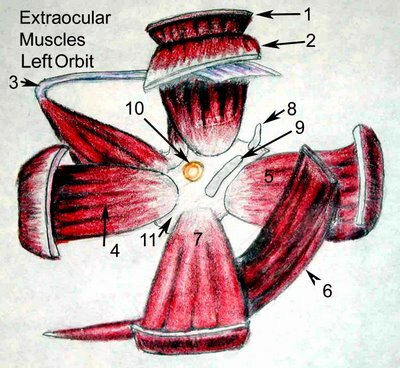 They empty directly into the fornix. The eyelids get much of their form from the tarsus, a specialized fibrous layer (6) that contains numerous clear sebaceous glands called Meibomian glands. The lower lid is similar to the upper lid but notice the shortened tarsal plate. 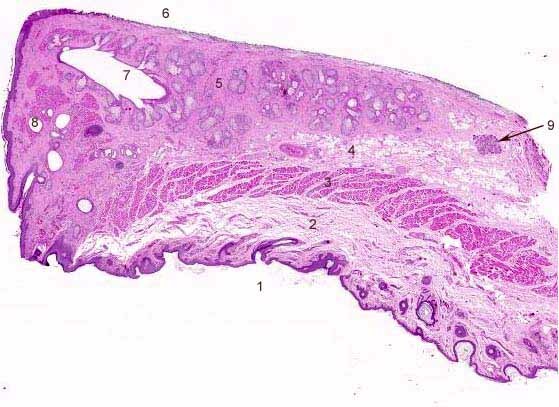 The upper lid has more Meibomian glands which may account for the greater incidence of sebaceous carcinoma in the upper eyelids. A pictorial rendition from Grey's anatomy is more graphic as to the numerous structures in a cross section of the eyelid even though the resolution is low. 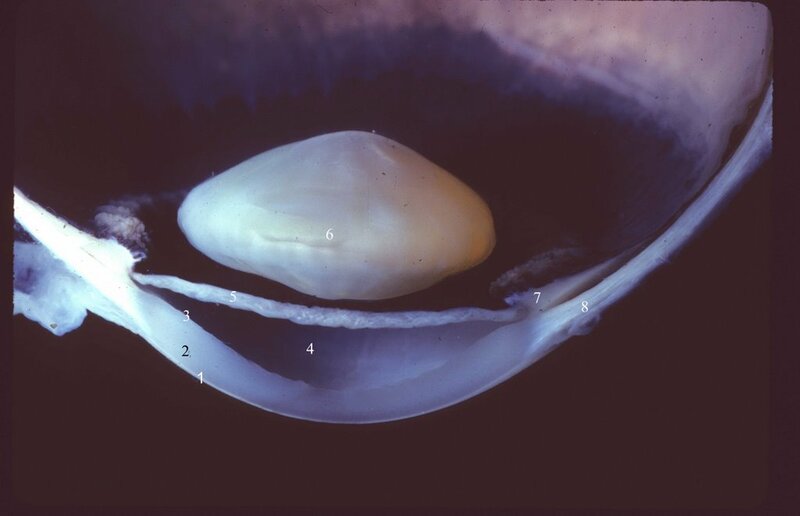 The levator aponeurosis(1 Fig left) , one of the elevators of the eyelid enters between the orbicularis oculi muscle and the conjunctival surface. 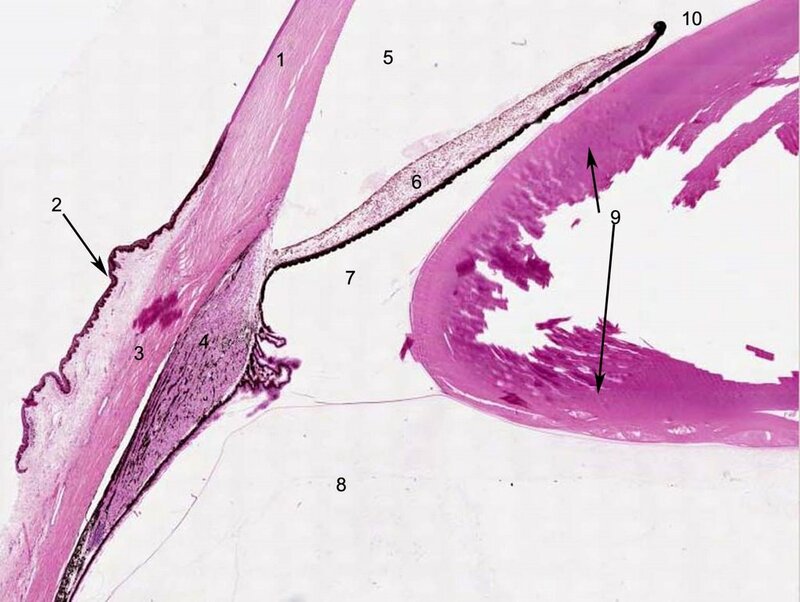 Accessory lacrimal glands of Wolfring are shown (2 Fig left ). 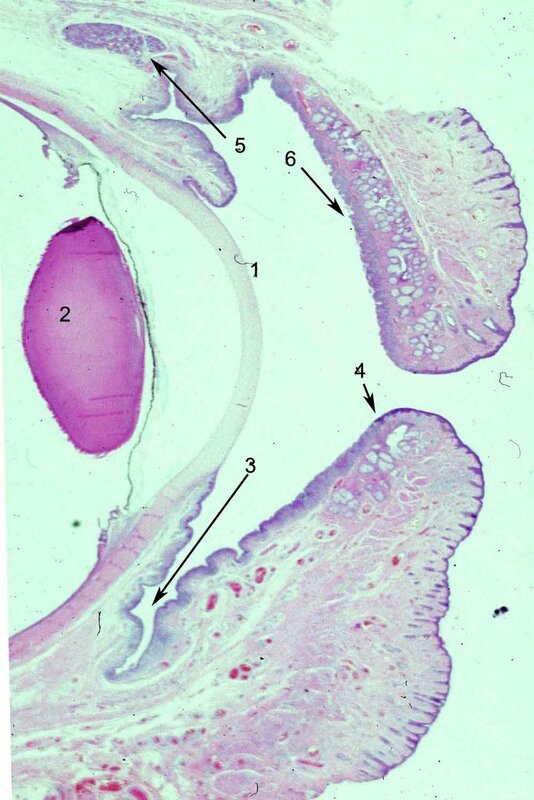 The meibomian glands (3 Fig left) of the tarsal plate produce the lipid that will line the layer of the tear film. 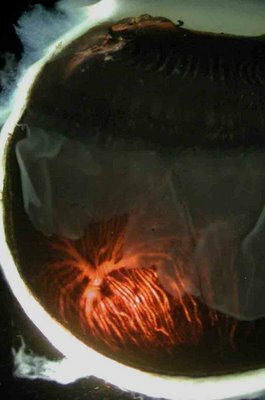 The Meibomian lids empty into ducts that dot the marginal surface of the eyelid and can be seen emanating droplets of oil for the tears. The orbicularis muscle (4 Fig left ) is striated muscle that is responsible for blinking and squeezing eyelids shut. 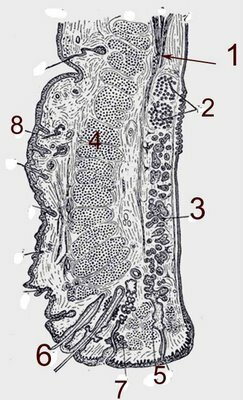 The cilia or eyelashes (6) emanate from the lid immediately adjacent to apocrine glands of Moll (7). 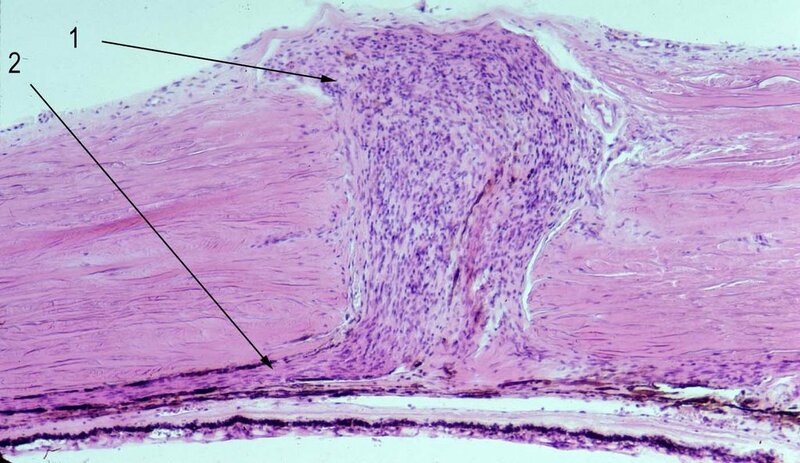 The skin surface (8) of the eyelid is the thinned epidermis in the body and contains hair and adnexa. The color image of the eyelid section provides an excellent opportunity to test knowledge of the eyelid structures. Click to enlarge the photograph and then see if you have correctly identified by the structures by using the back function key and correlating your answers with the numbers below. 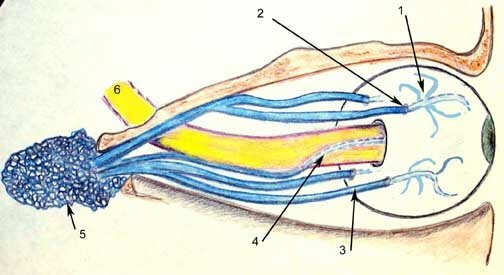 Lymphatic drainage: The upper eyelid drains to the parotid lymph nodes and the lower eyelid drains to the submandibular lymph nodes. This has ramications for tumors that have predilections for specific eyelids.